We are excited to announce ExpressHD, a revolutionary breakthrough in simplicity, functionality, and price. Got an old analog DVR system and camera? Are you considering replacing it with IP cameras and NVRs? 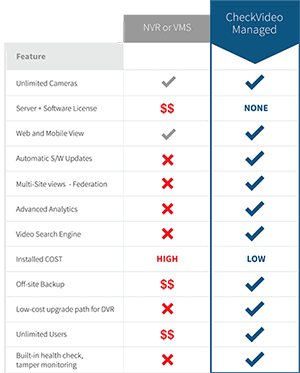 An upgrade to IP cameras gets you HD video, but requires new cabling, network equipment, and can get expensive. ExpressHD by CheckVideo allows you to leapfrog beyond NVRs to the latest high definition, cloud-enabled, smart security with video analytics. Best of all, this upgrade requires no new cabling, saving hundreds of dollars per camera.